It’s such a special moment when you say your wedding vows to each other on your wedding day, telling your partner how much they mean to you and that you want to spend the rest of your life with them. Take the most special words from those meaningful vows and handwrite them inside your wedding ring with the Peter W Beck Express Yourself service. With advanced technology, Peter W Beck can take your handwriting and engrave it onto the inside, or outside of your wedding ring. 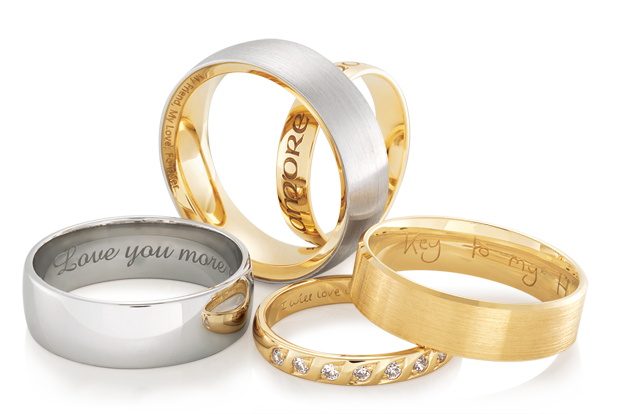 You can take a special phrase or time in your lives together and immortalise it by engraving it onto your rings. Choose from a selection of fonts, or alternatively use your own handwriting. Speak to your trusted jeweller about ordering your wedding ring with Express Yourself . Disclaimer: This service is only available on Peter W Beck products. Peter W Beck reserves the right to make slight variations to designs to suit engraving procedures. Designs are subject to approval by Peter W Beck. Express Yourself is a registered trademark of Peter W Beck Pty Ltd.